It’s such a lovely and easy meal. Tastes like summer 🙂 I love it freshly prepared with a slice of rye bread, my husband prefers it with piece of grilled chicken and should Bobcat have a picky day (again) then I just blend his portion into a sauce and serve it with pasta and cheese. 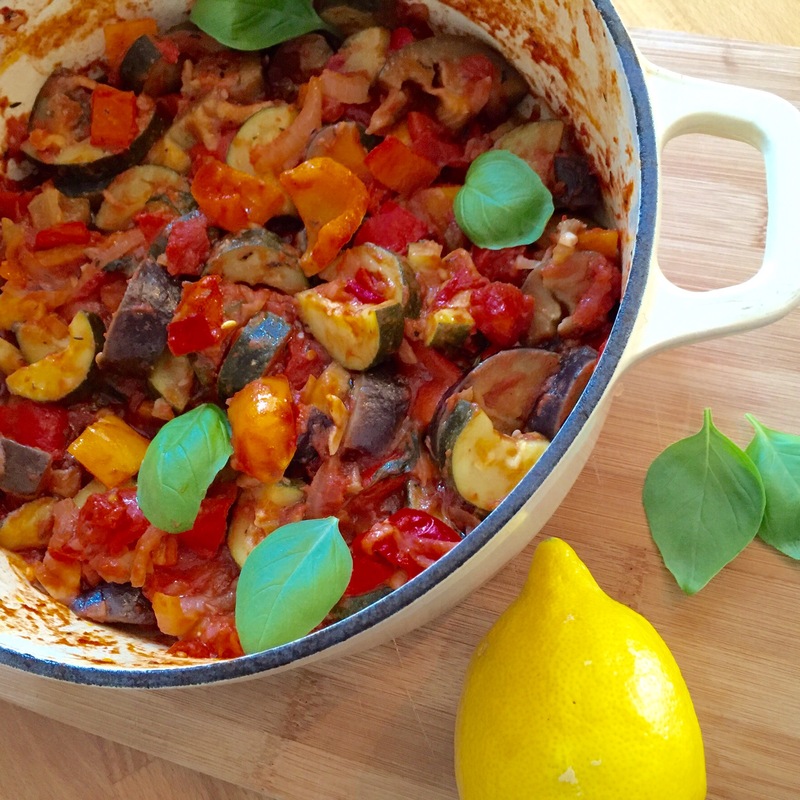 Voila, fresh and healthy dinner for everyone in 45 minutes. 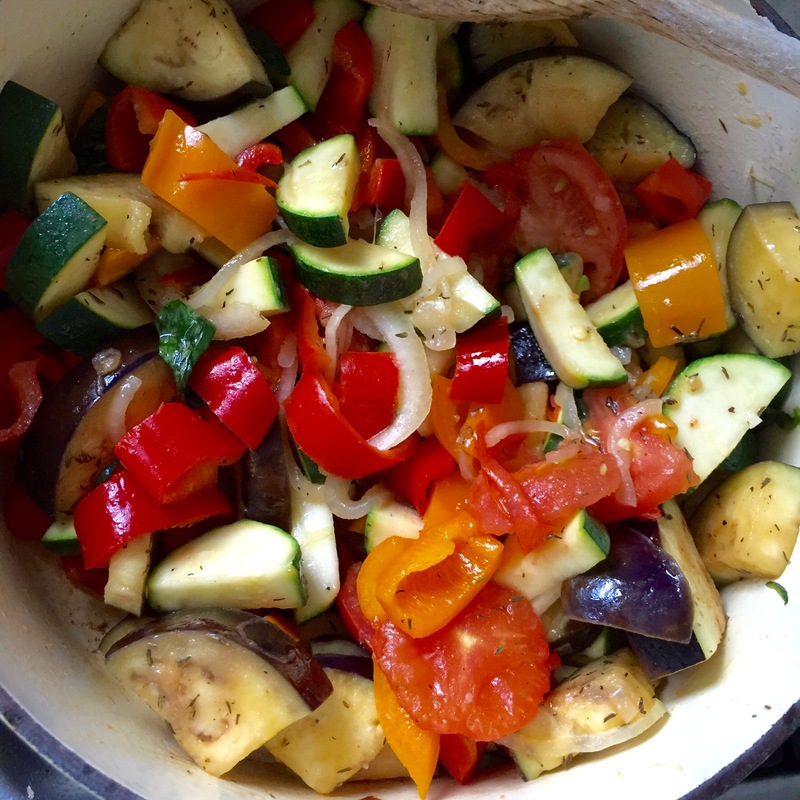 The most important is not to overcook the veggies. I cook them only until they still keep some of their firmness. This way they are going to preserve more vitamins and the individual vegetable pieces are going to keep their own flavour. 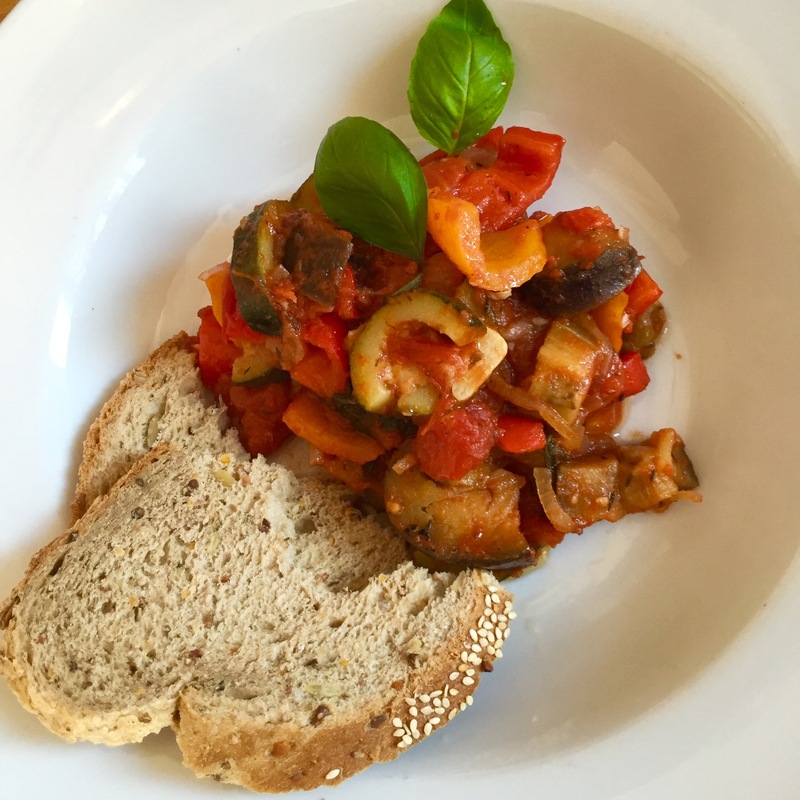 This is my take on a classic ratatouille, the recipe below serves a family of 2 adults and 2 children. First of all, I’m perfectly aware of the fact that I supposed to grill the vegetables in small batches first, then add them to the main casserole dish and cook them together. Well, this is what I have no time for as a busy mum 🙂 Instead, I put all the chopped veggies in to the casserole dish with the herbs, spices and olive oil and without the lid I let them to cook in their juices for 10-15 minutes on medium heat, stirring frequently. Then I add the tinned tomato and the balsamic vinegar, cover the pan with a lid and simmer them for another 25 minutes on low heat. Give it a stir a couple of times and essentially the dish should be ready when it starts to stick to the bottom of the pan – meaning no liquid left to cook. When it’s done, you can add some extra basil leaves for decoration and more fragrance.